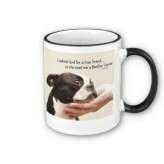 Great Mother's Day gifts for Boston Terrier Moms. 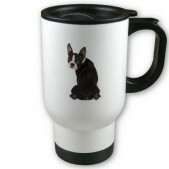 We have special Mother's day T-Shirts, Mugs, office items, jewelry, caps and figurines and various items the Boston Terrier loving Mom will enjoy. 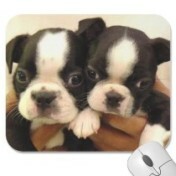 These fine Boston Terrier Gifts are a welcome gift to anyone who loves a Boston Terrier. 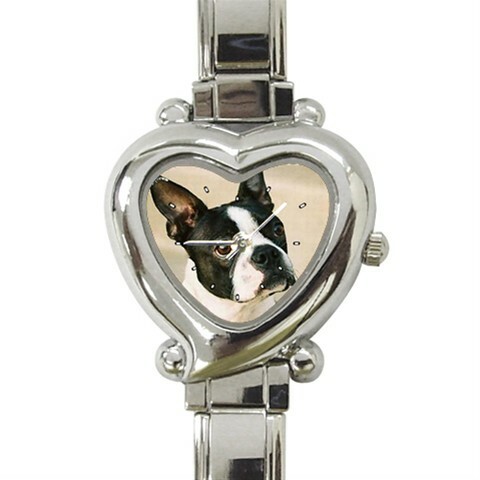 Click on the picture of the Boston Terrier gift to see a larger image of the gift. 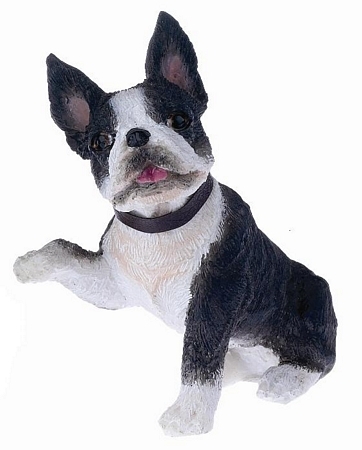 This lovely Boston Terrier Paws Up Figurine give the perfect greeting to you and your friends. It is a fine hand painted figurine of your canine friend. Cast in stone resin, they'll sit for as long as you want. Appx. 3" tall. Individually packaged. 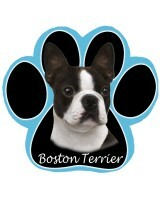 This fun Boston Terrier Friend Picture Frame combines true breed type with a touch of whimsy. Perfect for any informal room (kitchen/family/child's), it is totally adorable, with this pretty Boston Terrier holding the frame. Made of quality resin, it is hand painted and boxed for giving to a special friend or to keep yourself. Photo Size 2-1/2" x 3-1/2"
This classic scoop Women's Mommy's Little Boston Girl T-Shirt is a great gift for any Boston Terrier Mom. You will be charmed by her sweet face and charm. Makes a great gift for Mother's Day, Birthday, Christmas or any time! 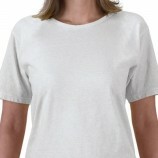 The classic scoop t-shirt is 5.6 ounce 100% cotton jersey knit, scoop neck with bound-on self trim, double-needle stitched sleeve and bottom hem. Imported. Loose, classic fit, wears well on anyone. Sizes run standard. This classic scoop Women's Mommy's Little Boston Boy T-Shirt is a great gift for any Boston Terrier Mom. You will be charmed by her sweet face and charm. Makes a great gift for Mother's Day, Birthday, Christmas or any time! The classic scoop t-shirt is 5.6 ounce 100% cotton jersey knit, scoop neck with bound-on self trim, double-needle stitched sleeve and bottom hem. Imported. Loose, classic fit, wears well on anyone. Sizes run standard. Boston Terrier T-Shirt with Pawprints has a lovely brightly colored Boston terrier surrounded by Pawprints on a white 100% cotton t-shirt. 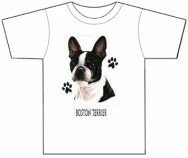 Send us your picture in jpg format to linda@bostonterriergifts.com along with any wording you desire (keep it short please) and we can create a T Shirt just for you. 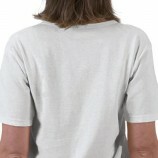 We will e-mail you a picture of the shirt for you approval before we ship you the shirt. The classic scoop t-shirt is 5.6 ounce 100% cotton jersey knit, scoop neck with bound-on self trim, double-needle stitched sleeve and bottom hem. Imported. Loose, classic fit, wears well on anyone. Sizes run standard. 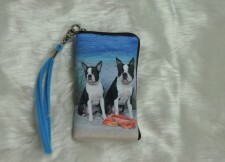 Our cute Bostons at the Beach Cellphone Bag is lovely accent for the Boston Terrier dog lover. It is lovely and features 2 charming Bostons at the beach with a lobster in front of them. Made of microfiber material it has a zipper with a large 7" turquoise handle that clips on and a turquoise polyester lining. There are 2 inside pockets. It can be cleaned by eraser or washed with mild soap and water. do not use bleach, wring or tumble dry. Size: 5" x 3" x 1/2". The Bostons at the Beach Cellphone Bag is great for every day use. 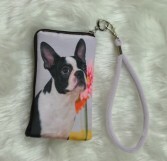 Our cute Boston Terrier with Pink Flower Cellphone Bag is lovely accent for the Boston Terrier dog lover. It is lovely and features a stunning Boston Terrier next to a lovely Pink Daisy and has a very pale pink background. Made of microfiber material it has a zipper with a large 7" pale lavender handle that clips on and a pale lavender polyester lining. There are 2 inside pockets. It can be cleaned by eraser or washed with mild soap and water. do not use bleach, wring or tumble dry. Size: 5" x 3" x 1/2". The Boston Terrier with Pink Flower Cellphone Bag is great for every day use. This captivating Boston Look Heart Shaped Ladie's Italian Charm Watch comes with 16 starter Italian charm links! The measurement of the watch face is approximately 1". The band length is 7 1/4" & can be adjusted to fit most lady's & children's wrists by removing or adding charms. 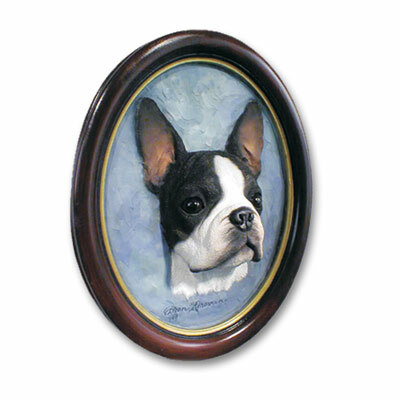 The Boston Terrier Portrait OVAL Picture is a special gift. Hand painted polyresin and beautifully handpainted and has life-like glass eyes. A beautiful sculptured three dimensional dog portraits. A perfect gift for any occassion. Truly charming! Boston Terrier Spa Slipper: These slippers feature a VELCRO® brand side closure, 100% cotton uppers and non skid soles. These slippers make a great quick and unique gift! 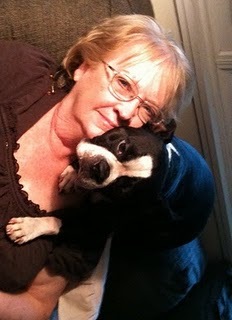 The Boston Terrier Apron with Wide Straps is great for the chef in your home! You don't have to worry if it will fit! Great gift for dad's grilling endeavors, too. Made of 100% cotton with Teflon finish for added protection; 2 waist level patch pockets with 1 pen pocket, 1 wide neck and waist ties, and adjustable neck strap. Measures 22w x 30l. Color of Boston: black or brown Describe your dog in the comment box and the manufacturer will do their best to match the coloring!